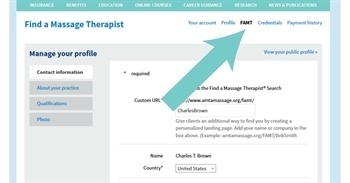 Take advantage of AMTA’s regular advertising and list your massage practice – even if you have your own website! Creating your profile is easy. Follow these simple directions to get set up! Log into your account and follow along to get your practice listed. 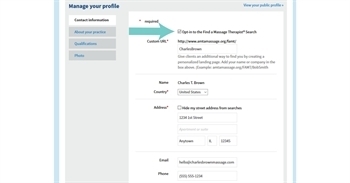 Complete the form with your contact information – and don’t forget to select the box to opt-in to the Find a Massage Therapist Search. You can create a custom URL as well. While your address is required it can be hidden from searches. This can be helpful if you come to your clients. Do you work for someone else? Include the address and contact details for the practice. Right below the opt-in box is where you can select your URL. This is another way to market your practice – your name or business name to create a personalized URL to share with current and potential clients. Your address will automatically show up. Double check that the information is correct for the location you work at. If you go to the client’s home you may want to select the box to hide your address from search results. Verify your email and phone number. These should be two ways clients can reach you to make an appointment. There is space to add a website and social media links as well. Let potential clients know what you offer and what else they may be able to do within your office. This information should include: modalities, clients accepted, insurance accepted, type of location, and your availability. 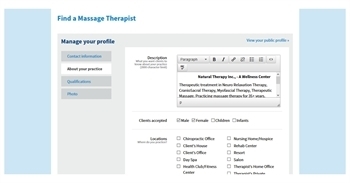 In the description box at the top let your clients know information such as: how best to make an appointment, about your practice and background, and additional information that may be helpful. If you work at a spa or retail location, this can be a good place to let potential clients know to ask specifically for you when making an appointment. Share your qualifications, so clients know you are licensed, certifications, and how long you have been practicing. This information is helpful for potential clients to know they are meeting a trained and licensed massage therapist. Add a photo to your profile. While this is not required it can make a big difference in generating client interest and putting a face with a name and practice. Once you click save you are all done! Review your profile. You can also try searching FindaMassageTherapist.org for your area, or by name, and see how it will look for a potential client.